The offerings in the fall continue apace with some excellent artists passing through the metropolitan area. 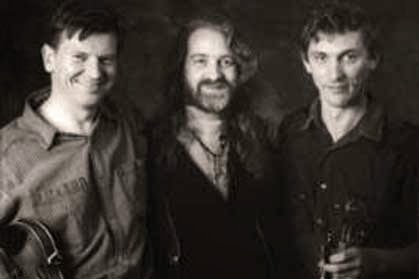 The fiddlers three known as the Celtic Fiddle Festival, Kevin Burke, Christian LeMaître and Andre Brunét, are celebrating 20 years as an ensemble this year and making a couple of appearances in New York. The troupe specializes in a rich array of Celtic tunes from Ireland, Brittany, Quebec, Scotland as well as from Sweden and Italy. They released a new CD, "Live in Brittany," recorded in January in Guémené-sur-Scorff. Burke is a master of the Irish fiddle repertoire. LeMaître hails from Brittany while Brunet is from French Quebec. They are accompanied these days by Nicholas Quémener who was in Kornog with LeMaître. They are appearing in New York on Sunday, October 13 at 7:30 p.m. at DROM (85 Avenue B). Visit www.dromnyc.com or call 212-777-1157. On Monday they will be at the brand-new Towne Crier Café in its new home in Beacon, New York (www.townecrier.com or 845-855-1300). The hostelry known for over 40 years for great acoustic music concerts and food including fantastic desserts relocated from its Pawling location to the Hudson River town of Beacon . . .
A VERY tasty duet will be coming into the area also this weekend with their first appearance at this Friday’s Blarney Star Concert at Glucksman Ireland House. Fiddler Jesse Smith, who grew up in Baltimore and studied with Brendan Mulvihill before moving to Ireland where he has been on a longtime exploration of music and artists from the 1920s, teamed up with uilleann piper Emmett Gill, who was originally from London but moved to Ireland for similar reasons. Last year they released a joint CD called "The Rookery," where they combed some manuscript collections as well as recordings from seminal influences like Seamus Ennis, Willie Clancy, Leo Rowsome, Bobby Casey, James Morrison and Padraig O’Keeffe. Glucksman Ireland House is on lower Fifth Avenue (www.blarneystar.com). On Sunday at 7:30 p.m. they will perform in a house concert in Fairfield, Connecticut for the Shamrock Irish Traditional Music Society, so the usual drill is in place if you want to attend. Go to their website www.shamrockirishmusic.org and make a reservation and you will receive information on where the house concert will be to ensure that there are enough seats for everyone . . .
YOU can’t talk of Masters of the Tradition without thinking of two veteran musicians who teamed up last weekend in New York for two concerts where not only was their music sublime, but their stories about the tunes and the people who shared their lives back in the formative years of the Irish traditional music revival in the 1950s and 1960s was to be savored. Michael Tubridy and James Keane deserve a mighty bulladh bos (clap of the hand) for their efforts at the New York Irish Center and the Rockland Irish Cultural Center, and I’m delighted that they will have two more occasions this weekend to enlighten and entertain folks who relish the “Pure Drop” in Philadelphia and Baltimore. On Saturday, they will be at the Commodore Barry Irish Center in Philly (www.philadelphiaceiligroup.org) at 8 p.m., and on Sunday in Baltimore at a time and place not available at deadline, but check local listings and Facebook as they say for Dan Issacson’s music sessions, perhaps at Liam Flynn’s Ale House.